Time for another soup recipe, like I have mentioned in my previous post on Easy Vegetable Beef Barley Soup recipe, I love homemade soups. They are very comforting and healthy, especially warming in this cold winter weather. If you like soups as much as I do, you will probably love this cookbook too: 300 Sensational Soups by Carla Synder and Meredith Deeds. Most of the recipes are pretty easy and straight forward, there are also some very creative recipes such as the Raspberry and White Chocolate Swirl Soup with Brownie Croutons – that sounds very decadent. 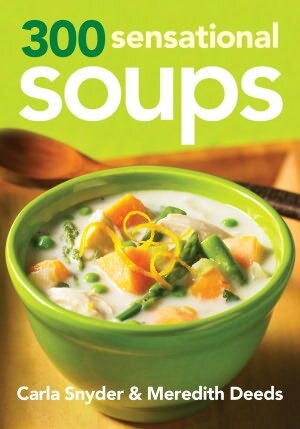 The book has 300 soup recipes, basically any soup you can think of – vegetable, chicken, chowder, chilled, desserts, etc. and even recipes to make your homemade stocks. Since it is winter, I chose a squash soup from the book to share. It is very easy to prepare and yet so flavourful. I love the butternut squash, it is a little sweet, and its flavour also complements the beef well. The thyme added a delicious earthy flavour. For the croutons, the recipe calls for white bread, but I used a sprouted grain loaf (trying to eat healthy here), and it worked well, they were buttery and crunchy. Season beef with salt and pepper to taste. In a large pot, heat 1 tbsp (15 mL) of oil over medium-high heat. Add beef in two batches, and saute until browned on all sides, about 5 minutes per batch, adding oil as needed between batches. Remove with slotted spoon to a warm plate. Reduce heat to medium and add onions to the pot; saute until just browned, about 5 minutes. Add bay leaves and thyme; saute for 1 minute. Reduce heat to medium, return beef and any accumlated juices to the pot and add stock; bring to a boil. Reduce heat and simmer until beef is tender and easily pulled apart, 1½ to 2 hours. Meanwhile, preheat oven to 425°F (220°C). On baking sheet, combine squash, the remaining olive oil, salt and pepper; toss to coat evenly and spread in a single layer. Roast, turning occasionally, until just tender and browned in spots, about 40 minutes. Remove beef from pot with a slotted spoon and, using two forks, pull about into bite-size shreds. Discard any fat and gristle. 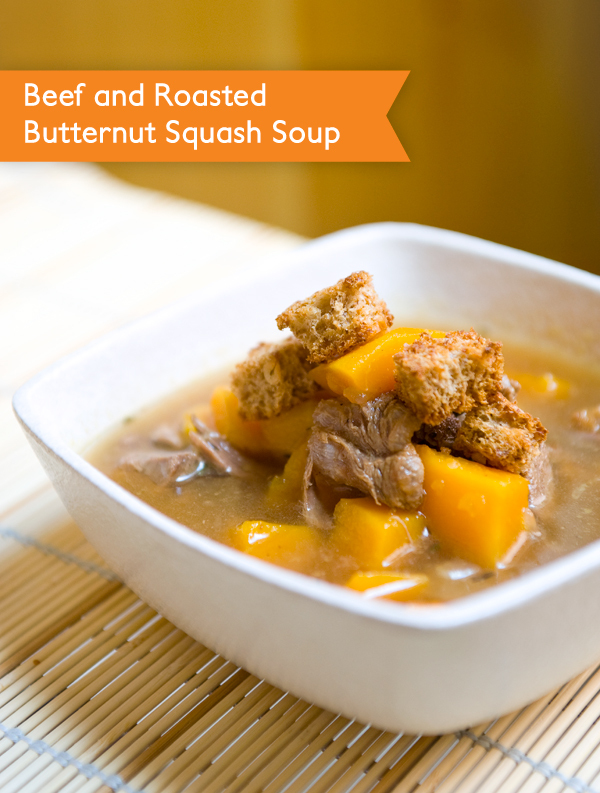 Return beef to the pot and add roasted squash; simmer for 10 minutes to blend the flavours. Discard bay leaves. Taste and adjust seasoning with salt and pepper, if neccesary. Ladle into heated bowl and garnish off with croutons. Preheat oven to 400°F (200°C) On baking sheet, combine bread, butter and salt; toss to coat evenly and spread in a single layer. Bake, stirring once, until crisp, about 10 minutes. Let cool on sheet on a wire rack an use within 3 hours. Excerpted from 300 Sensational Soups by Carla Snyder and Meredith Deeds © 2012 Robert Rose Inc. www.robertrose.ca All rights reserved: May not be reprinted without publisher permission. Also check out the gallery to see the process of making the soup!